Recto: a drawing of a seated youth drawing on a sheet of paper resting on his knees. In the left foreground a dog lies sleeping. Verso: a drawing of an ox. Here a youth is shown in everyday dress, seated on a low stool and hunched over a sheet of paper that curls over his knee. The light falls strongly from the right as if through an open doorway, though his facial features are barely visible and the drawing instrument he holds cannot be made out. 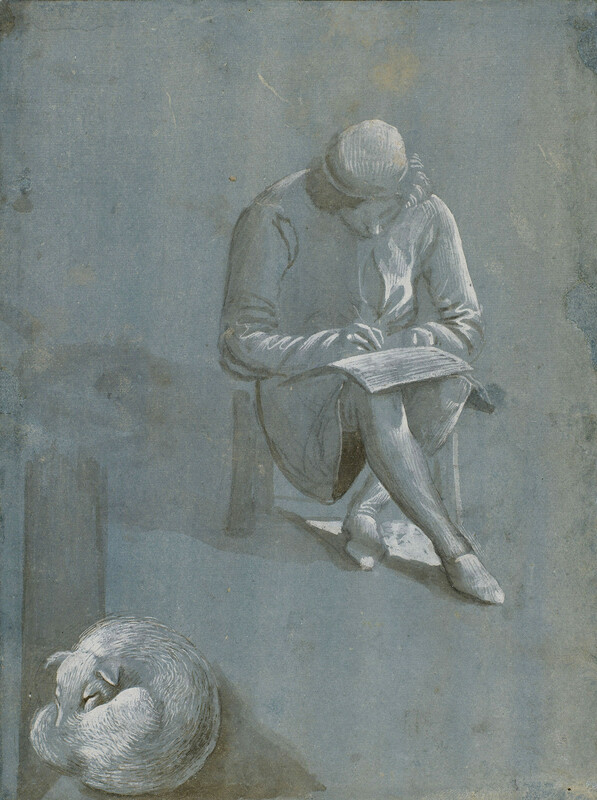 There is nothing grand or allegorical about the depiction: it is simply a drawing exercise, taking an everyday activity as its subject, and the draughtsman of the present sheet does not suggest that there is anything more noble or extraordinary about the act of drawing than there is about the sleeping dog, probably studied while curled up in a corner of the workshop. The author of the sheet has not been identified with certainty. The presumption has been that the sheet is Florentine, and Popham catalogued the drawing as Anonymous Florentine, but the technique is more typical of northern Italy (nb the paper is coloured with blue bodycolour on both sides, not 'blue paper' as it has been described). The fanciful traditional attribution was to Masaccio (Grosvenor Gallery exhibition 1877-8; New Gallery 1893-4), but recent scholars have attributed it to later fifteenth-century Florentine artists such as Piero di Cosimo, Davide Ghirlandaio (Berenson, 2nd edition, no. 862A), or – most plausibly – a follower of Benozzo Gozzoli (Degenhart & Schmidt, I.ii.474). The fifteenth century, especially in Italy, saw a rapid growth in the practice of drawing from the life, as distinct from the ‘pattern book’ tradition of established motifs handed down from one generation to the next. Initially drawing from life was confined to the workshop – sketching in the open air was a later development – and the subjects that might have been readily to hand feature prominently in such drawings. When a pose was required for a figure in a painting, an assistant of the artist would usually be asked to model (regardless of whether the intended figure was to be male or female) and casual studies of workshop assistants, unrelated to paintings, are common.